People have been using mixes of spices in their cooking (and medicine) for hundreds of years, and spices are what give Indian food its distinctive flavors. Curry powder is the quintessential mix of spices, taking on characteristics from whatever part of the subcontinent it is from. 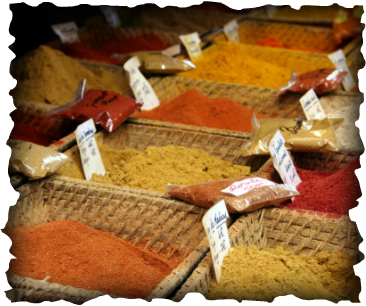 Almost all however carry ingredients in common, namely turmeric, cumin, and fenugeek. Of all curry powders I've tried (available in U.S. grocery stores), my favorite is the Simply Organic Curry Powder. You can get a 3-pack from Amazon.com, though for a sample you should be able to get this at any high-end grocery store like Whole Foods. A less expensive brand which is also good is McCormick Curry Powder. Curious what gives so many Indian dishes its yellow/orange hue? It's turmeric, and scientists believe it is the most important spice in the arsenal of Indian ayurvedic medicine for fighting unnecessary inflammation and cancer cells. Simply Organic Turmeric Root Powder is a popular brand. Peppercorn is native to South India and is one ingredient that adds fieriness to Indian food. Black pepper illustrates the synergy created by mixing various spices together, helping curcumin (the helpful component found in turmeric) get to the right place in your body. I like Spice Islands Black Peppercorn with Grinder because you can get freshly ground pepper which is fresher than the kind that is already ground in the bottle. Nothing is more quintessential to Indian cooking than spice. The kinds and amounts of spices used in cooking is what make Indian culinary traditions stand apart from the world's other great culinary traditions. People in South Asia learned over generations to use spices not only for taste, but to prevent and treat disease from Ayurvedic practices that coalesced around 1500 B.C. The best illustration of an Indian spice's role in health is turmeric powder (haldi in Hindi). Studies have shown it can, for example, reduce pre-cancerous lesions in the colon when taken in its purified form curcumin (Cruz-Correa 2006 Clinical Gastroenterology and Hepatology). At the molecular level, turmeric powder reduces the type of inflammation that cancer cells use for growth. India has among the lowest rates of cancers, including lung, breast, and prostate cancers (Rastogi 2008 International Journal of Epidemiology). Although Indian diets have worsened thanks to modernization, the heavy use of spices in cooking has not. Thus, adding turmeric powder and other spices like black pepper and ginger in Indian food likely explains why.